Renault has updated the Megane Renaultsport, with two new versions now getting a scorching 275PS, while the base model represents a price drop at £23,935. The two new Megane Renaultsport models, called Cup-S and 275 Nav, are both on sale now and replace the S/S Trophy and Trophy-R versions – though the latter was a £36,500 limited edition in any event. There have been many versions of this generation Megane Renaultsport since its introduction in 2010, though this latest £23,935 Cup-S edition is the best value ever. It boasts 275PS (the 2010 model was launched with 250PS, later increasing to 265PS), yet is around £1000 cheaper than the outgoing 265PS base model. A better equipped 275 Nav model is also available, priced at £25,935. Both new models are powered by a 275PS version of the same 2.0-litre turbo engine that’s featured in the Megane Renaultport since 2010. This time around, it returns a claimed 37.7mpg combined, emits 174g/km CO2 and delivers a 0-62mph sprint in six seconds flat. The main difference between the Cup-S and Nav models is the former’s Cup Chassis. It includes unique 18-inch alloys with Michelin Pilot Sport tyres, stiffened springs and dampers plus a mechanical front limited-slip differential for improved cornering traction. The Nav edition can be specified with the Cup Chassis for an additional £1350, while the Cup-S version can have a titanium exhaust fitted for £2500. The Nav edition comes with parking sensors, a hands-free keycard, an R-Link multimedia system and dual-zone climate control – all of which are optional with the Cup-S. 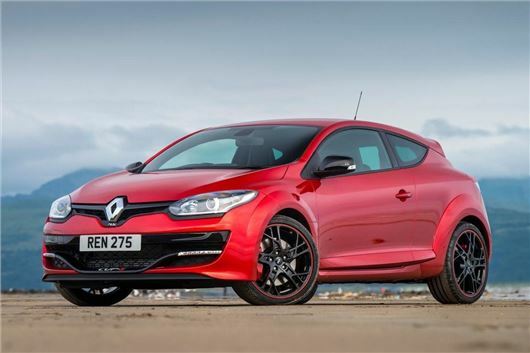 Available to order now, deliveries of the 2016 model Megane Renaultsport begin in November.